The temple complex of Bagan once housed over 13,000 temples, pagodas, and monasteries of which only 2,200 remain to this present day. Were they factually built by a succession of rulers and their wealthy subjects or is that once again one of the many tragic errors historians have made? Our research shows that this religious complex is far older than we have always been made to believe, way beyond our current historical paradigm. Fig. 1: The temple complex of Bagan is so vast and houses so many temples – it is almost beyond imagination. Built by the Pagan Emperors? Ask anyone what they know about the temples of Bagan and most people will either shrug their shoulders or tell you that some ruler or emperor in the middle ages built them. After all, that is what people are taught in school. Far too many of them have accepted these explanations at face value and have not questioned the origin of this temple complex ever again. 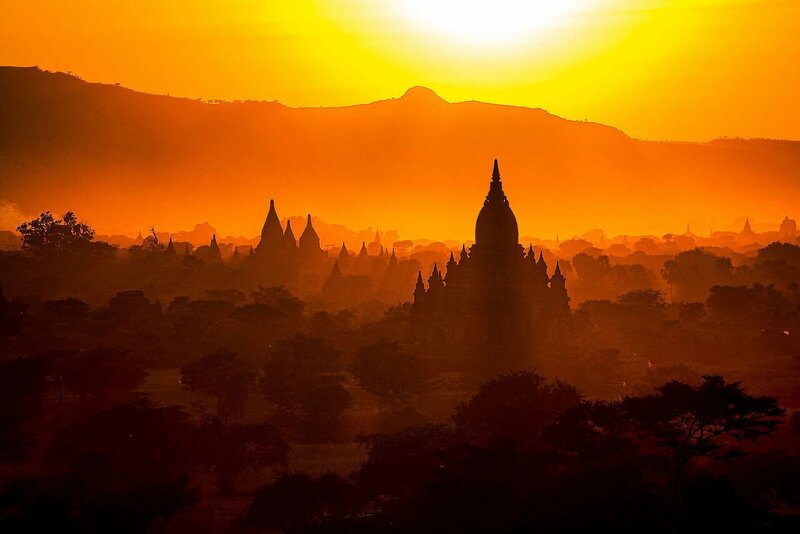 According to the Burmese chronicles, which the monarchy of Myanmar had drafted (note: the British colonials succeeded this monarchy), it is said that over a period of 250 years, the Pagan rulers built over 10,000 temples. Of course, the chronicles do not mention the reasons why anyone would spend a huge amount of effort and money to built roughly 40 temples each year, and that over a span of 250 years. Imagine that! Winston Churchill is reputed to have once said: “History is written by the victors.” Who are the victors in this case? The victors were the latest ruling monarchs, followed by the Colonials. They claimed the already existing temples as their own and then partially renovated them. Yet, the original orientation of these magnificent temples never changed and this proves once again that contemporary rulers prefer not to tell people the truth about the ancient past. China also has hundreds of pyramids and other ancient structures and they all are telling the same story as is told about the temples of Bagan. These temples of Bagan and in China are much more ancient than historians believe. How do we know that? By studying their orientation patterns. A surprising fact is that most temples of Bagan and pyramids in China are counterclockwise oriented. Historians are not able to explain the orientation patterns of these temples. Although mainstream historians tend to ignore many of these factual findings and conclusions, and, if pressed, they invariably answer with the words “coincidence” or “fortuitous.” However, such allegations have nothing to do with real science, it is guesswork! Some temples of Bagan are oriented to our current geographic pole but most are counterclockwise oriented. Anyone who is somewhat acquainted with our unique dating method will understand that these temples would always be counterclockwise oriented if they were once oriented to former geographic poles. Fig. 4: This overview shows how the temples of Bagan that are mainly counterclockwise oriented also correlate with the proven series of geographic Poles I to V. The probabilities are incredibly high that the temples indeed correlate with the very ancient poles and thus are much more ancient than mainstream historians want us to believe. Our mathematical method shows again that ancient history is different from than what one might have been told and that Academia’s age estimates for these structures are compressed by a factor of 50 from what they should be in reality. Why are the Temples Mainly Counterclockwise Oriented? Most of the Structures (63%) of the Bagan temple complex are counterclockwise oriented. It seems that modern archaeologists have overlooked this obvious fact. There is a group of temples (17.7%) which is slightly clockwise (+5.4°) oriented, and some of these temples even make an extraordinary large jump in the clockwise direction. Because this collection is so small, we can disregard them as an unimportant anomaly. Of course, we could try to solve the issue as to why these anomalies occurred and suggest all kinds of assumptions. But why would we do that? Some anomalies will always occur in every field of research. We focus on the two major groups – one that is oriented to our current geographical pole and the very large group that is counterclockwise oriented. The combination of these two groups comprises 82.3% of the temple complex. If we consider this counterclockwise orientation pattern of the Bagan temples, we discover that there would be only a 1 to 1.2 trillion (0.000000000083%) chance for that pattern to be sheer coincidence. That is why we can be 100% certain that it is the result of an unmistakable organized process of orienting the temples to former geographic poles. Why are we so certain? 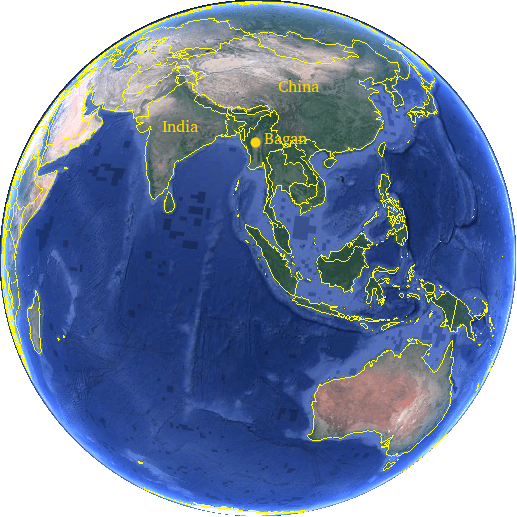 Because the largest group of temples (51) is oriented to our current geographic pole. That fact alone demonstrates the evident tradition in this region to always orient temples to the cardinal directions. For this orientation pattern to the current geo pole to be coincidental is next to impossible since there is only an amazing 1 to 2.0×1012 (2,000,000,000,000) chance for it to be sheer serendipity. Fig. 5: This Monte Carlo simulation is well suited for the structures of Bagan with respect to their orientation towards the Poles I to V and it provides instant proof of their true antiquity. With this simulation, we confirm the likelihood for the Bagan temple complex structures to correlate with the Poles I to V. No relationship is indicated in blue and the actual truth is shown in red. This provides us with instant proof of the true age of the temple complex which spans a period of more than 350,000 years. For insiders of these kinds of sophisticated mathematical techniques, it is easily noticed that all orientations of the Bagan temple complex truly self-evident. They relate to the ancient poles as well as to our current geographic pole. A wandering magnetic pole would not explain an alleged compass-based orientation because such an orientation would not even come close to prove anything for the last 4,000 years. Note for the skeptics: In these probability calculations, we already accounted for the massive counterclockwise orientations over a spread of 46° in the counterclockwise direction. If we had accounted for the equal possibility of clockwise orientations over the full 90°, which is obviously not the case as shown above in Fig. 4, the probabilities would be even higher and would not represent a reliable, truthful, and real-world situation. Fig. 6: The crust has heavily and frequently deformed over the last 440,000 years and we know of at least 4 former geographic poles to which many ancient structures were oriented by their builders. They cluster massively in several mathematical nodes, proving an unbelievable reality, namely that the Earth knew multiple former civilizations – lost in the mist of time. These ancient cultures are would still be in plain sight, if one only knew where to look. 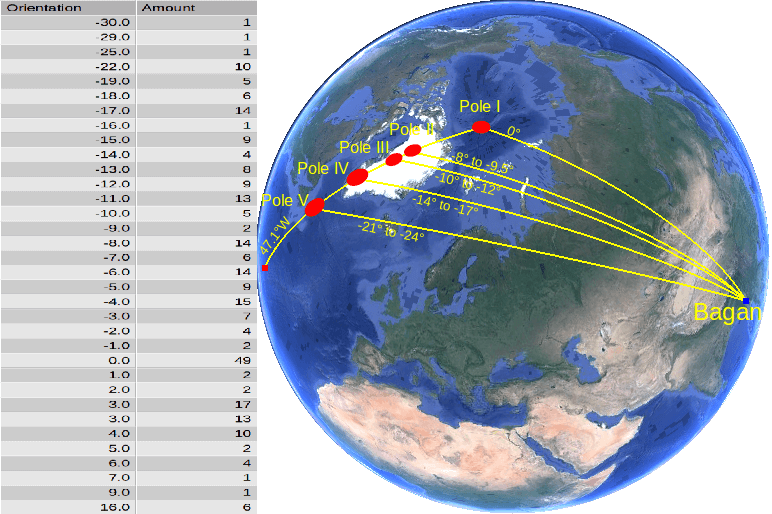 Additionally, these orientation patterns cluster around the same orientation nodes (Pole II to Pole IV) that we have already found and documented as proven facts. It is somewhat gratifying that the orientation pattern of the temples of Bagan confirms our theory. There is no doubt whatsoever why these temples are oriented in such an odd manner: they were built when the geographic pole was at another location. The temples of Bagan are therefore incredibly older than historians currently assume. It is important to also remember that we are always speaking of the orientation of the original foundations because we often see renovations on top of older foundations. If you focus on the top structures you will not find definitive answers regarding the true age of the entire structure. Orientation, when studied in large numbers, reveals the only plausible answer. The history of the temple complex of Bagan stretches over a period of more than 350,000 years. Our findings prove that any other age-related statement can only be an assortment of assumptions, falsehoods, and lies. 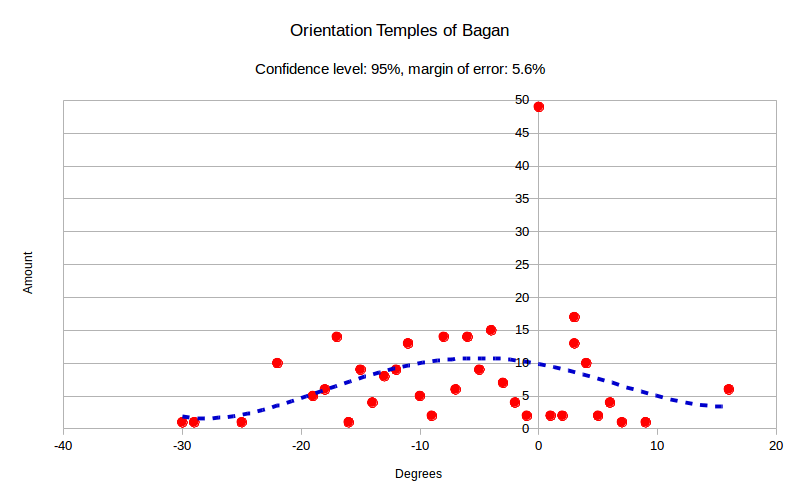 Graph 1: The orientation of the temples of Bagan is mainly counterclockwise, and therefore conforms to our theory, as do most of the other ancient structures in the eastern hemisphere of the planet. The blue dashed line shows the major trend. It points heavily to Pole II, Pole III, and Pole IV. However, one must realize that many of the ancient structures were probably destroyed long ago. Most of the temples of the Bagan Complex were already present when new rulers took over the area. As most megalomaniac conquerors usually do, they took possession of the temples, claimed them as their own, renovated them, painted them, and some structures even got a golden roof. The new rulers ordered the rewriting of existing records and destroyed all the ancient records. Tribes in possession of ancient knowledge were often persecuted to wipe out the true knowledge of the past. These new rulers probably never knew that, for the temples to achieve their full energetic potential, they had to be oriented to the contemporary cardinals. Historians are not interested in local folk tales but believe that writings left by contemporary rulers are the only reliable source. As is obvious, that is the only source which is not reliable. Fortunately, we have mathematics to set the record straight and to separate “official” historical nonsense from the truth. The Bagan temple complex is not the only very large agglomeration of ancient structures that successfully correlates with our new dating method. It is one of many others that correlate as well, and that is, of course, no coincidence – the Earth was host to at least half a dozen lost civilizations over the last half million years. Based on our mathematical models, we encourage every reader to individually stretch their perception and imagination to fill in the huge gaps that “history lessons” have created in our consciousness regarding our true ancient past. We realize that for some readers this might prove to be a difficult task, one that might need some “out of the box” thinking. Take your time and peruse our other “Antiquity Reborn” articles – it is a very worthwhile endeavor! Mr. Buildreps, Is it possible that the very distortion of the earth’s crust over these long times schemes might itself have skewed the temples’ orientations and exaggerated the cant clockwise and counter-clockwise. I ask this not to dispute but to examine other geologic contributors to the puzzle. I do admire your scholarship. Thank you for your support, David. It is exactly like you say; deformations of the earth’s crust is the cause of temples to be clockwise or counterclockwise oriented on such a massive scale. On a global scale this results into a pattern. The pattern matches the glaciation cycles. There’s very little chance for such complicated patterns to coincidentally match so eerily precise over each other.